At sunrise, the black smoke coming from the mountain community of Paradise as it burned to the ground 15 miles away looked like a roiling purple and pink cloud. The fire was spreading with incredible speed in the forested town of 27,000, and people were fleeing for their lives, many still wearing their pajamas. I rode the bike to the foot of the Skyway, the main highway into Paradise from Chico, about half a mile from the house. Cars were streaming down the hill bumper to bumper on both sides of the four-lane road, a vehicular caravan of desperate refugees. Someone was a holding a sign that slapped evacuees in the face: “God Is In Charge.” Does God enjoy making people suffer and die? It isn’t just California that’s on fire; the world is on fire. I stopped and spoke to man in a wheelchair with a “Vietnam Veteran” cap on. The old vet said a young man with burns on his arms came up and asked for the water in his basket. Paramedics then took him away. “I saw people on fire in ‘Nam, covered with the napalm that we dropped,” the vet said without emotion. War memories spilled out of him, disconnected from the present and from and any discernible feeling. When he said that Fox News was the only news that told the truth. I shook his hand and left. It made me wonder, how many people fleeing for their lives in this American caravan of suffering have been heartlessly nationalistic about the caravan of mostly women and children fleeing violence in Central America? Does Americans’ fellow feeling now extend no further than 50 miles away? A bit overcome, I rode to a nearby café, where I met two young men who had driven through flames and embers as their house was engulfed behind them. They were surprisingly calm, but then, shock gives the appearance of calm. As of this writing, the weirdly named “Camp Fire” that destroyed the ironically named town of Paradise is already the most destructive in California history. 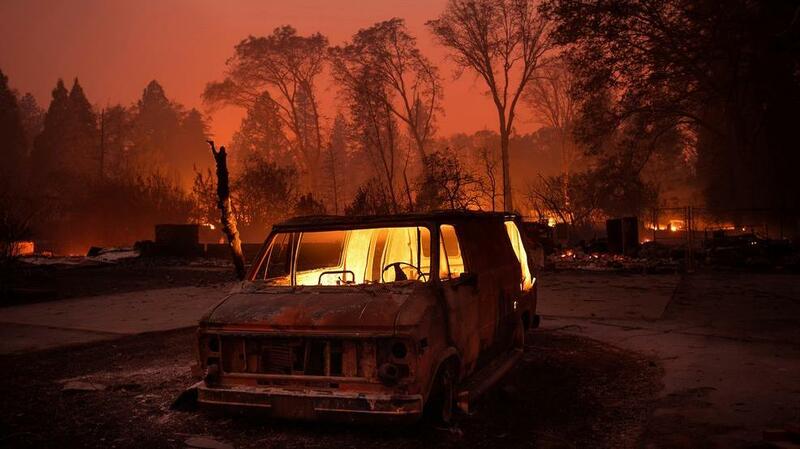 Nine people are confirmed dead, five burned alive in their vehicles, and many more are missing. The fire has consumed 100,000 acres, about 150 square miles, and destroyed nearly 7000 structures, with at least three times that number still threatened. 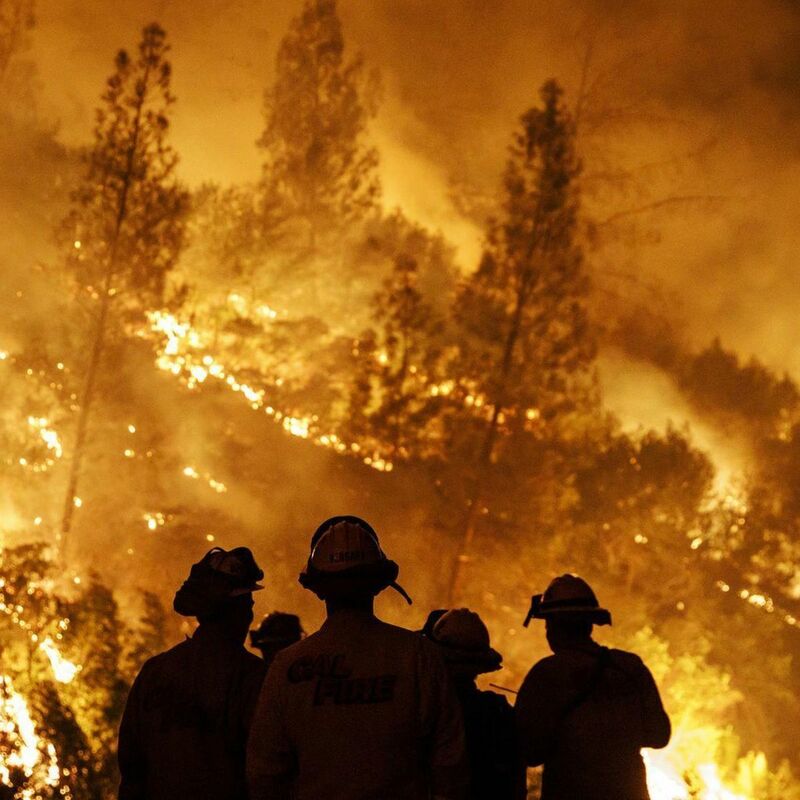 In one day, it became the worst fire in California’s history. “This event was the worst-case scenario,” Butte County Sheriff Korey Honea said. “It’s the event that we have feared for a long time.” The local media runs endless loops of the usual tropes—memories lost, hope maintained, and the kindness of strangers. Five of the last twelve worst fires in the state’s history have occurred in the past year. Catastrophic climate change is happening here and now. In Chico, the smoke and ash have driven the air quality off the charts. A reading of 300 is called “very unhealthy,” and 400 “hazardous.” It’s an unheard of 600 here at present. A metaphysician is going to ask metaphysical questions regarding man-made mass tragedies. The night before the fire started at dawn in northern California, an ex-Marine slaughtered 12 people in college bar near Los Angeles. Hellish fires and evil furies, why are these things happening? Is there a why? In physics, there is a proven principle called ‘non-locality,’ where an electron in one place instantly affects an electron in another, with no apparent link. It’s called ‘entanglement,’ and they have no idea how it occurs. The world is no longer local. Everything that happens is global now, instantly affecting everyone on the planet to some degree, whether we see it or not. Perhaps that’s always been the underlying nature of human consciousness, but it’s now indisputable, and only denialists and nationalists refuse see it. We can grow our hearts in response to the human crisis, not shrivel them in self-centered activity.